How passionate Tash and the rest of the cast and crew were about their webseries was easily my favorite thing about the novel. It was phenomenal to see them all be super-pumped for having the chance to work on this project and then getting more recognition and even the much-desired Golden Tuba nomination. I want more characters in YA who are so dedicated to something they are passionate about, be that a sport, youtube, blogging or whatever else. The description of the filming process was stellar. I'm not necessarily into film-making, but it was still incredibly fascinating to be reading about how a webseries is made. By the way, it makes perfect sense why the description of the filming process seemed so accurate and well done - the author herself has created a webseries before, titled Shakes and Weird Sisters, see them here. It definitely showed that she herself was passionate about the subject she was writing about. Here's to hoping she'll do Anna Karenina one day, because the way it was described in the book sounds really adorable, which is not something I thought I'd ever say about Anna Karenina. On a side note, I'd never watched a webseries before reading Tash Hearts Tolstoy, but I just got so excited to check one out that I binged The Lizzie Bennett Diaries in a few hours. Yes, it was that good, and I can't wait to check out other webseries now. But back to the book! I liked that even though the cast was, well, not huge per se, but somewhat big, the author still managed to create characters who were easy to remember. I'm not saying all of them had equal role in Tash's life, but it was fun to get many distinct personalities, and then some who had their own sub-plots. Jay and Tony's budding romance was a great (and adorable) addition to the story, while Jack and Paul, Tash's best friends, were definitely the second most important characters after Tash. Jack was this stoic girl who was rarely seen smiling or showing excitement... or, you know, any emotions at all, but she was a fierce, protective and amazing best friend and sister to Paul. Paul was so incredibly precious!! It's like, if Jack was the moon, Paul would be the sun, because he was just full of cheerfulness and was so adorable and I want a Paul in my life like, yesterday. Now onto Tash - her character had a lot more complexity than I expected at first. I loved how the author wasn't afraid to show that Tash wasn't perfect, that she was, indeed, rather selfish at times without even realizing it. BUT THAT WAS OKAY! Making mistakes is a part of growing up and the way she owned up to her mistakes was super-inspiring and brave as hell. I loved the parts about her talking about being asexual, about how she first identified as asexual and about how she's still romantically attracted to guys and can find them aesthetically pleasing to look at. Beware, that there's one character in particular who was very harsh to her, bringing up the typical things people spout against asexual people. This, I believe, could be triggering to some, but it is, of course, called out and Tash is incredibly strong-willed and sure in her sexuality, so while it does sting, she shakes it off and knows what the person is saying is NOT true. 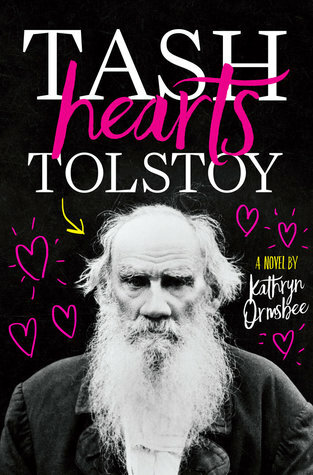 Tash Heart Tolstoy was an incredible book that deserves a lot more buzz than it's received so far. It's one of the few books with an asexual heroine and, even though, I believe it's not an #OwnVoices novel, it's received praise from asexual reviewers for its accurate representation of asexuality. While it was a bit slow-moving and even boring at some parts, it's still a fantastic contemporary novel about passion, dreams, friendship and love. Totally recommended. I have never watched a web series, but I have actually heard of The Lizzie Bennett Diaries. People always rave about it. Anyhow, this book already had my attention, but your review definitely makes it sound totally worth my time. I know it's a reflection of reality, but man! I get so mad when people feel the need to get all judgmental about things that impact them in NO way, such as someone's sexuality. Great review! I have never watched a web series before but have heard about The Lizzie Bennett Diaries, so should probably get around to it at some point! Yess, Chiara, read it!! I swear you won't regret it, because it is truly one of the best YA contemporaries I've ever read. AND THE CHARACTERS ARE AWESOME OMG. Same! Can't believe there are so few books where the characters are truly passionate about something. Smh, we def need more of those.